PT Bank Rakyat Indonesia (Persero) Tbk - Bank BRI is a reputable state-owned commercial bank in Indonesia. Bank BRI has major business competencies in Micro Banking, Retail Banking and Middle and Corporate Banking. PT Bank Rakyat Indonesia (Persero) Tbk is a public-listed bank and is majority owned by the Government of Indonesia. 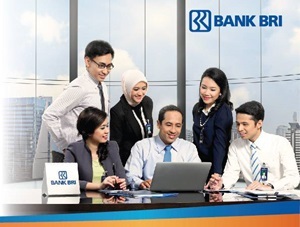 Bank BRI's shares are listed on the Indonesia Stock Exchange (IDX) with stock code BBRI. As today, the Government of Indonesia holds 56.75% shares in Bank BRI which represented by the Minister of State-Owned Enterprises (SOE). Other 43.25% remaining shares in Bank BRI was owned by general public and investors. Based in Jakarta, Bank BRI running business through 10,646 total operating office units spread in all over Indonesia (as of December 2017). Its operating office comprise of 1 head office, 19 regional offices, 1 special branch office, 467 branch offices, 610 sub branch offices, 5,382 BRI Units, 992 cash offices, 2,536 Teras BRI units, and 638 Teras Mobile Units. Bank BRI has 6 subsidiaries/associate companies; PT Bank BRISyariah Tbk (BRISyariah), PT Bank Rakyat Indonesia Agroniaga Tbk (BRI AGRO), BRI Remittance Company Ltd, PT Asuransi Jiwa Bringin Jiwa Sejahtera, PT BRI Multifinance Indonesia, and PT Bahana Artha Ventura. In term of financial performance, Bank BRI continues to deliver a strong performance in the business year of 2017. According to information found in PT Bank Rakyat Indonesia (Persero) Tbk Annual Report 2017 as cited by JobsCDC.com, Bank BRI booked total asset of Rp1,126.3 trillion at the end of 2017 or 12.2% increase as compared to Rp1.003,6 trillion in 2016. For total income for the year 2017, Bank BRI recorded growth by 10.7% in 2017 to become Rp29,04 trillion. Bank BRI's total income for the year 2016 amounted to Rp26,2 trillion. Minimum D3 education from all accredited departments / faculties (PTN / PTS). Minimum GPA of 2.75 (scale 4). Have experience in banking / marketing, preferably in the field of managing funds (Funding) for at least 1 year. Have high integrity and initiative. Have a wide relationship / networking. Have SIM A / C.
Not have nuclear family relationships within the company. Willing to be placed in the entire work of Bank BRI Pekanbaru Regional Office (Riau Province and Riau Islands Province). Maximum age of 25 years old (not yet 26st birthday at initial selection). Honest and act consistently with the Bank's policies and ethics. Able to improve the quality of work for customer satisfaction. JobsCDC.com now available on android device. Download now on Google Play here. Please be aware of recruitment fraud. The entire stage of this selection process is free of charge. PT Bank Rakyat Indonesia (Persero) Tbk - D3 Funding Officer, Frontliner BRI March 2019 will never ask for fees or upfront payments for any purposes during the recruitment process such as transportation and accommodation.